And now for something completely different. A first in terms of this months featured species being written by Indian member Balaji Vijayakrishnan and, if that isn't different enough for you, also that delightful thing of a CotM being written about a fish from the authors homeland. I will leave you in Balaji's capable hands. "A Grey Job : A term that perfectly defines some of the more gorgeous catfish species. This article will be a short experience of mine with one such species." I got a call from a good friend and a fellow hobbyist around three years back saying he was planning to give away a catfish. He said it was a Rita species and found it a bit too aggressive to keep with barbs. I assumed it was a Rita rita as they are the most commonly available species of Rita but decided to take it off him anyway. A visit to his place a short while later revealed a fish that did not resemble the R.rita I was keeping at that point of time. A few mails and posts later, I realized I had a Rita chrysea at hand. 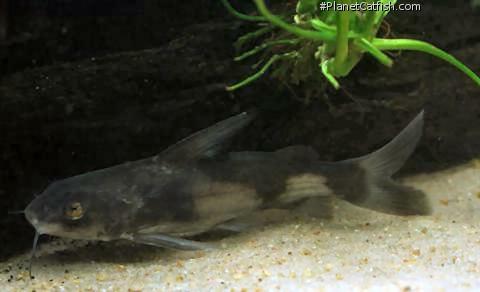 Thus started my acquaintance with one of the most beautiful bagrid catfish I am keeping currently. Specimens for the trade were collected from the Brahmani River in Orissa. The collection locality was a moderately fast flowing part of the river. One bank of the river was heavily vegetated. The opposite bank had small sandy beaches and there were huge boulders strewn around. The fish were collected from the sandy regions and from between the boulders. I keep my R.chrysea in a tank filled with gravel, lots of big sized rocks/pebbles and plenty of driftwood. It uses a triangular piece of drift wood for its ‘lair’. One interesting things I have noticed about this fish is that it seems to be irritated by gravel. All the gravel underneath its ‘lair’ is cleared out in seconds with the use of its caudal fin. I found out about the fine sand in its habitat only recently and hence, will recommend anyone planning to keep this species to provide fine sand. Rita chrysea is strictly nocturnal and will not be visible during the day unless food is dropped in. Big surprise eh??? A well known trait of the Grey Jobs. At night however, this species is quite active constantly patrolling its territory. With regard to food, any good quality sinking pellets is taken without any fuss. I feed Hikari Carnivore, ANS Sinking Pellets, Tetra Bits, JBL Novo Bits, JBL Mari Pearl and live blood worms on a rotational basis. Though not essential, I spot feed the fish and it has become quite a brat as a result of this. This species is not really finicky about water parameters. I keep mine in regular tap water and follow a 70-80 % weekly water change routine. We get water that is quite hard but it doesn’t bother the fish at all. As this species (like most bagrid catfish) hardly moves towards the upper layers of the tank, vacuuming the substrate to remove debris/waste will be essential in order to maintain health. Tank temperature routinely reaches 33 C in peak summer and can drop to around 28 C during monsoon. Now comes a crucial part, tank mates. The only ‘non-catfish’ I have kept with this fish are a Glossogobius giuris ,a Garra mullya and a Puntius dorsalis. The other tank mates are assorted Mystus Sp and Pseudomystus siamensis. I find that while this species is territorial, it is not overtly aggressive. Any intruder is dealt with swiftly but I have never seen any of the other fish injured as a result. Recommended tank mates would be bigger barbs like Puntius sarana,Puntius dorsalis, Puntius orphoides, or Labeo Sp and some of the larger mastacemblid eels for the bottom level. As an indicator, fishes collected in the same waters as R.chrysea include Barilius bendelisis, Garra satyendranathi, Tor mosal, Labeo Sp, Bangana sp and large Mastacembelus armatus. While keeping a single specimen is ideal, a friend is currently keeping two (gender unknown) in the same tank and has reported aggression between the two only during feeding. The key lies in providing secure hiding spots. The Verdict: was there even a doubt? A gorgeous catfish that is hardy as well. Not the most common combination. Go for it if you are looking for the perfect catfish for a fairly large tank. While this fish has become rather rare in the trade presently, some specimens have started showing up in Singapore recently. It used to appear as the Black Gold-eye Catfish in Indian lists. If you do have the opportunity to keep this fish, don’t let it pass, or forever be bereft of the Crown Prince of The Grey Jobs. Etymology The name Rita is derived from the local name of the fish. The specific epithet comes from the Greek chrysos, meaning gold, in reference to the color. Eye large (30-40% HL), palatal teeth in large quadrangular patch covering most of palate, dorsal spine serrated. Feeding Readily eats all manner of live and prepared foods. Will eat smaller fishes. Furniture Provide plenty of driftwood as hiding places. Compatibility Although a fairly peaceful fish, it will eat smaller tankmates and is therefore best kept only with large, robust fishes. Larger cyprinids (e.g. Osteochilus) and larger spiny eels (Mastacembelus) are ideal tankmates.